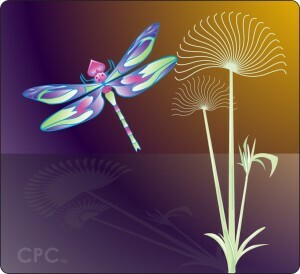 The Community Pain Center has chosen the Dragonfly as the Community’s symbol. The legends and myths that surround the dragonfly are symbolic of many of the beliefs that can help guide people with pain. Dragonflies are a species of insect that have inhabited our planet for almost 300 million years. ~The dragonfly is recognized as an amazing insect and in almost every part of the world it symbolizes change and self-realization. The kind of change that the dragonfly represents is in mental and emotional maturity, or in other words, to better understanding the deeper meaning of life. The traditional association of dragonflies with water also gives rise to this meaning, with it scurrying flight across water representing an act of going beyond what’s on the surface and looking deeper into the implications and aspects of life. For those in pain, our lives can change and can at times lead us to improved self-realization and the finding of a deeper meaning of life. ~When a dragonfly glides across water it only flaps its wings a mere 30 times a minute, while mosquitoes and houseflies need to flap their wings 600 and 1000 times a minute respectively. For people in pain, we are best served when we can learn how to accomplish things with a minimum amount of effort. ~The dragonfly is known to move with elegance and grace that can be compared to a veteran ballet dancer. People in pain who have learned to function well despite their pain, often move gracefully and slowly in order to protect themselves. ~The dragonfly exhibits iridescence on its wings, as well as on its body. Iridescence is the property of an object to show itself in different colors depending on the angle and polarization of light falling on it. This magical property of iridescence is associated with the discovery of one’s own abilities by unmasking the real self and removing the doubts one casts on his/her own sense of identity. This again indirectly means self-discovery and removal of inhibitions. The pain community has gone through a stage of discovery that has removed much of our self-doubt that our pain wasn’t real. As we learn more about the causes and treatments for chronic pain the community will continue to explore different means of self-discovery and with better treatments and improved health, each person will experience the removal of inhibitions. ~The style of life the dragonfly experiences, symbolizes and exemplifies the virtue of living IN the moment and living life to the fullest. By living in the moment you are aware of who you are, where you are, what you are doing, what you want, what you don’t and make informed choices on a moment-to-moment basis. This ability lets you live your life without regrets like the great dragonfly. When in pain it’s important to live in the moment. The more you focus on the past and future, the less likely you will be able to appreciate life. Without worrying about the past or fearing the future, your present will be easier and happier. ~In China, people associate the dragonfly with harmony and it is often used as a good luck charm. Among Native Americans, it is a sign of happiness. It is our hope that those who come to the Community Pain Center will find harmony and happiness, and their lives will change and become easier day by day.